Powers/Abilities: False Face concealed his true identity behind a seemingly endless succession of face-masks; he had the habit of randomly pulling off and discarding a mask to expose the next one beneath (see comments). Armed with a handgun, False Face was not much of a physical fighter (Bob Brant commented that False Face wasn't so tough without a gun). 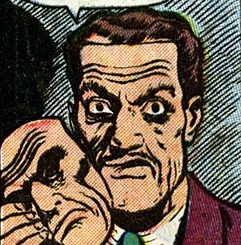 History: (Man Comics I#26/1 (fb) - BTS) - The origin and criminal history of False Face is unrevealed. (Man Comics I#26/1) - Concerned that the country of Norovia would vote to side with the Western democracies at the United Nations, "certain enemies of democracy" (possibly Russia) promised False Face the sum of a half-million dollars if he undertook a task for them; False Face was assigned to kidnap delegate John Carter and detain him until the special U.N. session was over so the communists would win the vote -- Carter had been appointed as a proxy-vote for the minister of Norovia when the minister was recalled. 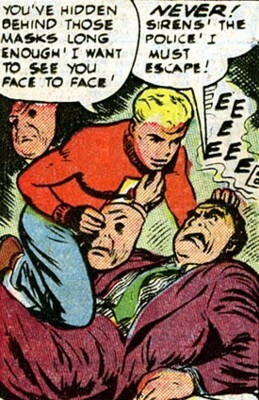 Upon learning that teenager Bob Brant had been selected by a city committee to act as the city's honorary mayor-for-the-day, False Face figured it would be the perfect opportunity to create a diversion for the police with a "half-baked kid" attending to the office, so he set his nefarious scheme into motion and dispatched his henchmen to City Hall. After arriving at the mayor's office, the henchmen held Bob and the Trouble-Shooters at gunpoint; then they forced Bob to telephone the police commissioner and had him send all available patrolmen on a wild-goose chase to quell a phoney riot. But one of the henchmen mentioned that False Face was about to kidnap Carter, so following a brief skirmish, Bob and the Trouble-Shooters made their escape and headed to Carter's home to warn him. But False Face was already at John Carter's house -- the criminal had taken the U.N. delegate, along with Carter's daughter Carol, and Carol's friend Bess as his hostages. 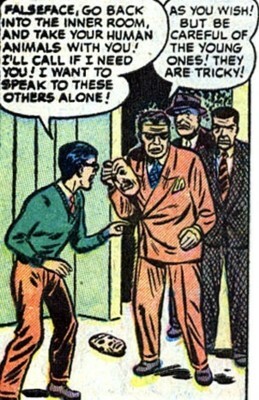 As he drove his prisoners to his hideout in an abandoned tong warehouse in Chinatown, the villainous False Face didn't know he was being followed by Bob and his buddies. After gaining entrance into the warehouse, the four Trouble-Shooters confronted False Face and his gang. Using squirt-guns filled with Chinese mustard, Bomber, Daffy, and Feathers temporarily blinded the henchmen. Bob swung from a chandelier and landed on False Face, pinning him to the floor; then the teenager pulled off two more of False Face's seemingly endless masks in an attempt to get a look at the criminal's real face. Suddenly alerted to the sound of approaching sirens, False Face pushed Bob off and made his getaway. When the police arrived, False Face's henchmen were taken into custody, and John Carter got to the U.N. in time to cast a deciding vote against communism; but the multi-masked malefactor had escaped. (Man Comics I#28/3 (fb) - BTS) - False Face returned to ally himself with teenage mutant Roger Carstairs -- it was hardly a friendly partnership, for unknown to False Face, Roger planned to kill him when he was done using him. Roger employed his mental powers to create illusions of monstrous insects that frightened people inside banks to death, then False Face and his men would steal the cash. Several banks were robbed in this manner, and False Face hid the money under the floor of Roger's laboratory; Roger's father noticed False Face and his men hanging around with his son, and he didn't like the looks of them. (Man Comics I#28/3) - In an effort to find Roger some "good, wholesome friends," Mr. Carstairs invited Bob Brant and the Trouble-Shooters to his estate; while they were outside Roger's laboratory, Bob saw a man entering the building and recognized him as one of False Face's henchmen. Mr. Carstairs accompanied Bob and the Trouble-Shooters into the lab to confront Roger, and they were captured by False Face and his gang; Roger ordered False Face to lock them in an inner room, then Roger began to use his powers to attack them with his mentally-projected bugs. The group managed to break down the door and escape into the main room, but the mental-projections spilled out after them. As the imaginary insects began to overwhelm him and his gang, an angry False Face shot and apparently killed Roger, then made his escape as the hallucinatory bugs disappeared. Throughout his appearances, this character's name was given inconsistently -- sometimes as one word, sometimes two, sometimes hyphenated, sometimes preceded by the definite article the. How False Face could comfortably wear so many masks was unexplained; and it's unrevealed why he wore the masks -- he didn't use them to impersonate other people, and if he just wanted to hide his face, one would have sufficed. But I had a completely speculative thought: Maybe False Face was a mutant, and his power was to constantly regenerate his facial skin-cells while shedding the outer epidermis of his countenance (somewhat similarly to the mutant Husk (Paige Gutherie)); true, that would seem to be a rather limited ability for him, but perhaps he never learned to use his power to its full potential -- with practice, possibly he could have regrown new faces to disguise himself as anyone else. While speaking to him, Roger Carstairs referred to False Face's henchmen as "your human animals" -- could that perhaps be interpreted that Roger considered False Face an equal (i.e. another mutant)? Maybe Roger originally allied himself with False Face with the hopes of recruiting him as an underling for his own "Brotherhood of Evil Mutants," but found him to be uncontrollable. 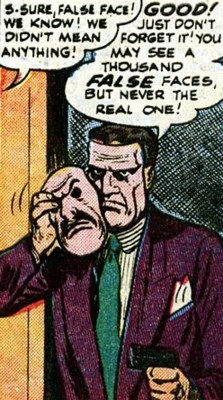 Or maybe False Face was suffering from some kind of supernatural curse which continuously covered his face with magical masks (an idea which was used a few times in various horror/fantasy stories). I'm guessing those discarded masks eventually decayed into dust, so False Face wasn't concerned about leaving behind any evidence. 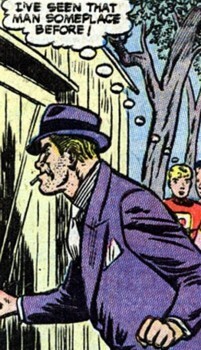 In Fantastic Four I#10, the Earth-616 versions of Stan Lee and Jack Kirby created a similarly named villain -- perhaps they based their creation on old news reports about this criminal. If you look at False Face you will see that it looks like he has a face mask over his face, so I wonder if he too could be cursed like the Man Without A Face. A group of thugs employed by the criminal False Face (numbering at least four, none identified, although one name -- "Bugs" -- was mentioned). 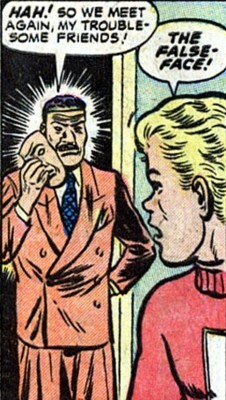 Three of the henchmen went to the mayor's office to force Bob Brant to place a phoney emergency call to the police commissioner. Shortly afterward, they were temporarily blinded when the Trouble-Shooters shot Chinese mustard into their eyes, and they were taken into custody by the police. 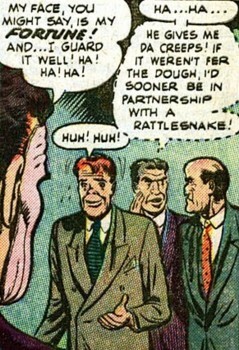 Later, at least one of the original henchmen returned when False Face joined forces with teenage mutant Roger Carstairs to commit a series of bank robberies; when Roger's insect illusions began to overwhelm False Face and his gang, possibly some or all of the henchmen died of fright, but False Face escaped.